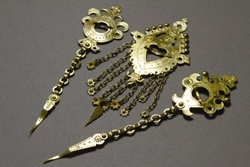 In 2012, Ivan Rosinský from Banská Bystrica was awarded the title of Master of Folk Art Production from working with metal in preserving the original forms of folk jewelry. Rosinský came from an environment which was rich in knowledge of folk craft and folklore as well as the utilization of traditional materials such as metal, wood, and leather. His relationship with crafting was inherited from his grandparents though he founded his career solely. He researched style, motif, and the shapes of jewelry from literature, craft fairs, exhibitions of folk art, and ÚĽUV stores. He made the patterns his own by suiting them to his own persona. The simpler pieces gradually become more complex. For decoration he used stamps with motifs of stars, flowers, wheels, tulips, triangles, shells, and fans. Among the assortment of Ivan Rosinský's creations can be found rings, buckles for men's collars in many shapes, hair pieces, brooches, brass clasps for bracelets, purses, and bells. Belt buckles are also strongly represented. His artwork carries a range of leather products – bags, belts, and sheaths for knives. He also produces styled jewelry embedded with semi-precious stones. Ivan Rosinský actively participates in folk crafts markets, held during the folk festivals in Detva, Východná, and Kežmarok.